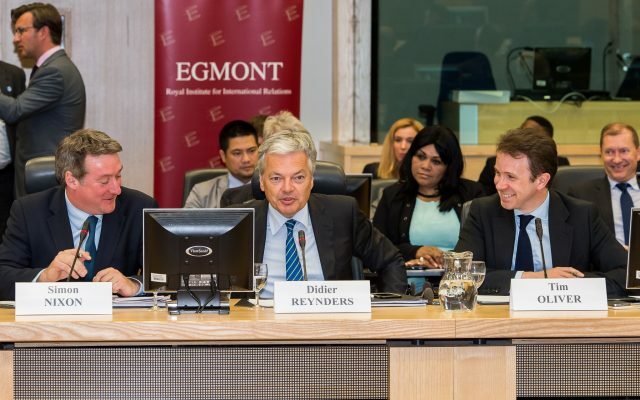 Photo by Institut Egmont, during the event "The State of the Union After the British Referendum." Speaking at the Egmont Institute’s ‘State of the Union’ event with former European Council President Herman Van Rompuy, Danish EU Commissioner Margrethe Vestager, and Belgian Deputy Prime Minister Didier Reynders, Dahrendorf Fellow Dr Tim Oliver outlined how the UK’s referendum has raised more questions than answers and that the eventual outcome is likely to be shades of grey, rather than some false dichotomy of in or out. The British vote to leave the EU has left many in Britain, the rest of the EU and around the world searching for answers as to why the British did what they did and what it could now mean for the UK and the rest of the EU. British politics has been thrown into a period of profound change, with Britain’s economy, constitution, identities and security all in a state of flux. An EU that has muddled through crises in the Eurozone, Schengen and Russia – to say nothing of ongoing problems of productivity and demographics – has now to face an added crisis that will test its resolve. Why then did the British do what they did? Three lessons are clear. First, nobody should be surprised that the British people voted to leave an organisation that for forty years has domestically been the subject of a largely negative, Eurosceptic debate. David Cameron was reaping what he had himself sown. He could not threaten to leave the EU as a way to get a renegotiation only to months later tell the British people that the UK’s membership of the EU was a matter of war and peace. Reversing decades of negative views in such a short campaign was always going to be an uphill task. Second, many have pointed to the vote being the backlash from the ‘left behind’, communities and individuals who don’t fit into the UK’s globalised, open economy. There were clear links between economic circumstances and support for leaving the EU. However, foundations for such economic motivations were laid long ago. Large numbers of the ‘left behind’ were left behind by economic changes of the 1970s, 1980s and 1990s. Focusing on economics, however, misses how this was a referendum defined by views on what type of country Britain should be in terms of its values, identities and outlook. Divisions over values cut across age, income, education, and party affiliation. Anger or concern about identity, especially English nationalism, and immigration turned the referendum into a vote on a wide array of issues that reached beyond trade, wealth or sovereignty. It’s also unclear what in voting ‘leave’ the British people voted for. As was blatantly obvious to those who work on the topic, there was no clear post-vote plan for Brexit. As the Guardian put it, leave campaigners achieved a victory with no plan, ‘as clueless about post-Brexit Britain as Bush and Blair were about post-invasion Iraq.’ This may in part be because some leave campaigners such as Boris Johnson and Michael Gove did not expect to win, instead using the referendum as a means to an end of advancing their own careers within the Conservative party. The outcome has been anger, and an anger that will only grow. At the moment the anger is found amongst remain voters. One survey by the LSE found that almost half of 18-24 year olds cried or were left feeling distraught by the result. In time the anger and frustrations of remain voters will be complemented by that of leave voters left feeling cheated by the realities of the negotiations that are now unfolding. Leaving the EU is unlikely to make much of a difference to a number of the reasons that drove people to vote for leave. Leaving the EU is not going to bring about economic change for deprived areas. Nor will it settle arguments about English identity within the UK, of divisions between urban and rural areas and especially between a global London and the rest of England, or arguments about austerity and funding the NHS. The leave campaign seemed to operate on a mantra of nothing is true but everything is possible. Broken promises – the famous £350 million that never existed and will therefore not be spent on the NHS, or the unlikely decline in immigration unless the UK economy goes into free-fall – are likely to make people even angrier. Trust and confidence in Britain’s political institutions can only decline further. The lack of a clear strategy for dealing with a leave vote means further votes will take place to define what ‘leave’ means. One vote could be a second referendum to approve any exit plan agreed between the UK and the EU. Or the vote could be in the form of a general election, although because of the fixed term parliament act a new election cannot easily be called before the one due in 2020. A vote is taking place amongst Conservative party members as they decide who is to be the UK’s next prime minister, a vote shaped by the various Brexit negotiating positions of each candidate. Or it will come down to the House of Commons, and to a lesser extent the House of Lords, where the government will need to see any exit deals voted into law. As Henrik Enderlein summed it up: the issue will now depend on whether the outcome is influenced by the median Tory voter (58% of whom are estimated to have voted leave), by the median UK voter (52% of whom voted leave, but where opinion could or has changed), or by the median MP (around 500 of whom backed a remain vote). Once again, the potential for anger and frustration amongst the general public is very real. Candidates for Conservative leader run the risk of making some unrealistic promises that they will later have to row back on. Meanwhile, HM Government is consumed with dealing with the fallout from the vote. Whether economically, legally, diplomatically, socially or just in terms of administration and time, a large chunk of government time, energy and resources is going to be used up. If there is one thing about this entire vote that has been consistently overlooked and which remains unclear, it is the reaction of the rest of the EU. When in 2013 I wrote the SWP report, ‘Europe without Britain: assessing the impact on the EU of a British withdrawal’ I was shocked to discover how little analysis had ever been undertaken into not what a British exit might mean for the EU, but how the exit of any member state would be managed. Analysing the idea of a member state withdrawing from the EU was a taboo. The idea remains a difficult one for the EU to face even in the reality of such a vote having taken place. This is not only because of deeply embedded ideas of the EU as a forward moving, progressive project. It is viewed like a bike; you must keep moving forward or you fall off. It also reflects the place of the EU as Europe’s predominant organisation for economics, politics, social matters and non-traditional security cooperation. It makes the EU resemble something permanent, inescapable. It is the Eagles ‘Hotel California’: you can check-out anytime you like, but you can never leave. Such an outlook runs the real risk of being myopic, but unless the EU implodes then it will be a reality of European politics that Britain will not be able to ignore. Each of the options on the table for a new UK-EU relationship will therefore ultimately fail to varying degrees to cut out the EU’s involvement in British life in the way some leave supporters might like. At the same time, they also mean they won’t cut the UK out of the life of the EU as some elsewhere in the EU might like. It might seem that the options for a new relationship have been examined ad nauseam. But they have been examined in terms of what is good or bad for the UK. What will be decisive is what is good or bad for the remaining EU because, with the exception of some basic WTO trading relationship, the adoption of any of the others will require the approval of every EU member state and the European Parliament. That will be a diplomatic minefield of mega-proportions, and one neither side should relish because of the possible acrimony that it could bring for all concerned. It will also reveal that none of the options currently on the table could adequately deal with the scale and complexity of UK-EU relations. Even in the UK, debate about future relations have focused on trade. Discussion often ignores the wider political, social and security relationships. This is despite the fact that even when it comes to trade relations will likely vary from area to area, changing as both the UK and EU adapt and evolve as part of a wider transatlantic and global economy. Britain and the EU could certainly find a way forward in security and defence cooperation, although we should not overlook doubts as to Britain’s willingness and ability to do so. We should also not overlook that the UK’s EU membership has never been a clear, settled one. Opt-outs have been the most obvious manifestation of a relationship that has been different shades of grey. The new, ‘out’ relationship will more than likely reflect this even more with darkness in areas where cooperation is minimal while others are light and filled with cooperation of varying kinds. About the author: Dr. Tim Oliver is a Dahrendorf Postdoctoral Fellow working on Europe-North American relations. Tim’s research interests focus on transatlantic relations, European geopolitics, British-European relations, British government and politics, and the UK’s foreign, security and defence policies. This post is based on a talk given at the Egmont Institute and DLA Piper’s ‘State of the Union’ event on 4 July 2016.